There is a lot of fun to look forward to this summer. Warmer weather gives you the chance to enjoy being outside, celebrate holiday parties or any other gathering. And every good get-together needs plenty of great food. If you want to host something that is a little different than hamburgers and hot dogs, why not try a pig roast? If that sounds like it’ll hit the spot but you’re not sure where to start, a catering company can take care of that for you. If those Michigan skies look clear and you’re looking to add a little extra pizzazz to your next summer event, here are some reasons why a pig roast is a great option. Believe it or not, pig roasts were all the rage, even in the old days. In medieval times, kings and their fellow nights would feast upon them. Now it’s your turn. A pig roast can add an ambiance of glory and honor to your feast. Pig roasts are perfect for a birthday party, a family reunion, and even a wedding. If your goal is to create one of the grandest events during a summer gathering, pig roasts will make it so. Even though pig roasts are awesome to witness and dig into, they can be a bit complicated to cook. Professional caterers know how to handle the pig in the oven and make it look good. The process itself takes approximately 12-16 hours. So, if it’s your first roast, the best decision is to let a catering company handle it. There are a lot of side dishes that can go well with a pig roast. The compilation of the pig with a variety of sides is what will essentially make your event a feast. Caterers offer dishes such salads, fruits and vegetables, and of course, a whole dessert course. Discuss with your caterer what kind of sides you like to make sure everyone will be satisfied. Professional catering companies can do the cooking on site and make sure everything is prepared when your guests arrive. The food will be well cooked, the sides will be served, and refreshments will be available. What about seating, utensils, plates and napkins? They’ve got you covered with that. Once the event is over, you won’t have to worry about cleanup either. Pig roasts are pretty glorious catering events, but you don’t have to break bank to enjoy it. Professional caterers often provide a bundle price featuring the roast and including your choice of side dishes, seating, preparations services, and clean up. They’ll even have their own cooking preparations with mobile roast trailers and will create a buffet-like feel for your event. 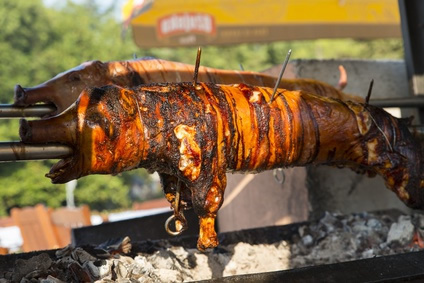 If a pig roast sounds like the event of the year this summer, contact David Graham Events for a free quote on pig roast catering in Michigan.